Its always exciting seeing hot cars being tested at the Nürburgring, which simply means production is the next step! Here we see the insane all-new mid-engine Corvette doing some hot laps. Since the beginning of the Corvette, everybody in the US has been on their toes hoping for Chevrolet to bring a mid-engine V8 sports car to the public. American's want the claim to fame of taking down the Euro supercar giants and there’s a sense of pride in proving everybody wrong about American cars. If you’ve watched the old British Top Gear at all, it seemed like the Americans were always under attack about their “rubbish” cars. In the last 10 years, that’s changed dramatically for the better. With Corvettes and Cadillac's setting Nürburgring records and Dodge creating one of the consistently fastest (and relatively affordable) straight-line cars in the world, those 'Mericans' have shown they're not playing around. It looks like Chevy is finally on top of what the public wants, a mid-engine Corvette and, now that Ford’s GT supercar is back, they have to compete in that market. This competition among manufacturers is what makes these cars continually improve. The latest chatter of a mid-engine Corvette were just pictures of what looked like a Holden Ute smashed together with a new Stingray. It was definitely a sign that the mid-engined ‘Vette was near, but not concrete proof. Now we have that. For a while, we’ve known that the next-generation Corvettes hide in Building 54 at Milford Training Grounds. They hide indoors and only venture out at night to hide from wandering eyes. 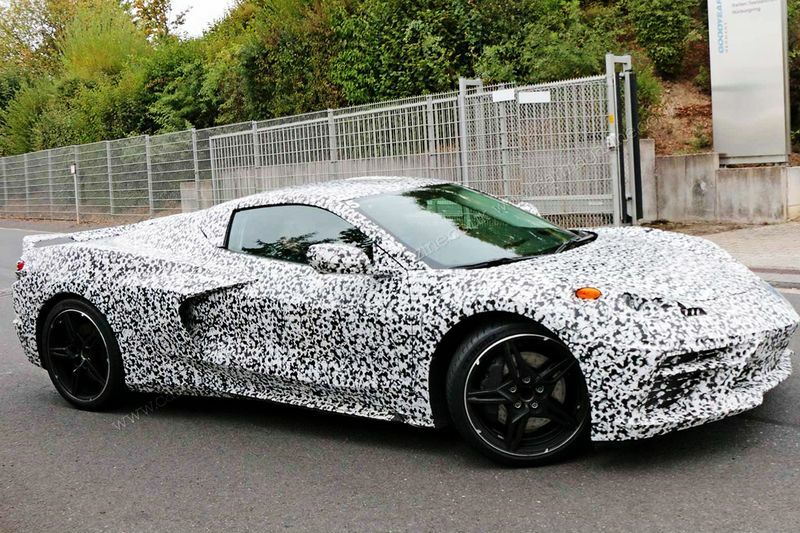 Fortunately, they let their guard down a little and a photographer nabbed these photos of what appears to be the new Corvette on the track. They aren’t (completely) hiding it in disguise anymore. Here it is… Watch out, Ford, the GT-eater is here. What do you think it will look like with that wrap gone? The car will probably come out around $80k+ to start with packing an LT1 or another 400-500hp powerplant then, after a model year, come out with a DOHC 32-valve V8. Eventually, we expect to see the hybrid drivetrain coined E-Ray that GM has trademarked to appear in this mid-engined masterpiece. What do you guys think? Ready for the Corvette to take on the world?